Cooking on the CDT. The learning curve. And a mixed bag. When I think of hiking or backpacking, I think of me and maybe a friend or two. I have not ever considered packing food for a group. Cool, a challenge! I’m not sure if I have posted my summer intents this year. But I signed up to cook for a trail crew on the CDT (Continental Divide Trail- Montana) in the Bob Marshall Wilderness. It’s an 18 mile hike each way and 7 days in the back country. I am more then excited about it. Anyway, I’ve been doing my homework and the one thing I haven’t found is anything on how to pack for a trail crew. But I have found that you can exist on much more creative meals then peanut butter, noodles and pop tarts…THANK GOD! I’ve found possibilities such as Pad Thai, Mountain man soup, Tuna casserole and so forth. Lots of calories to keep the workers in energy as well as proteins and vitamins. It also means I’ll be able to cook for Vegetarians and Vegans if there are any. I would like to dehydrate as much as I can here at home so that is going to be another challenge. I have dehydrated all sorts of foods and barks for my kids and I. From the typical jerky to fruit trail mixes and even pasta sauce, However this will be a larger scale. I’m definitely up for a challenge. I totally feel it’s worth every minute. Montana is so full of amazing trails and back country and I really feel it could be utilized more with maintained trails. That’s what this group is setting out to do. Clear up and fix up those trails for the adventurers. Montana Wilderness Association (CDT Montana) is so awesome, because everyone going on this trip is volunteers. I am also acquainted with a guy who will be hiking the CDT this year, so it will be pretty awesome to know I played a part in his journey. Cool, huh? In case you’d like to take a peek at his adventure, Check out 26. He finished the PCT last year and now takes his interesting twist to the Continental Divide. Ron puts a spin on hiking by debuting wedding attire, yes, I said it, wedding attire on his hikes. You have to love a guy who will sport tuxes & Kilts while being a sport on the trail! You can also check out his website hiking26.com. While I am out here promoting people, places and locations (Proper nouns) I figure, I’ll put a thanks out to Bighorn Outdoor Specialists as well. After a whirlwind winter I realized that I had totally spaced my Oboz , I had put on layaway with them. My husband was awesome enough to remember for me and Bighorn was super cool and is letting me pick up where I left off! Whew, because they really are the most awesome shoe I put on my foot! 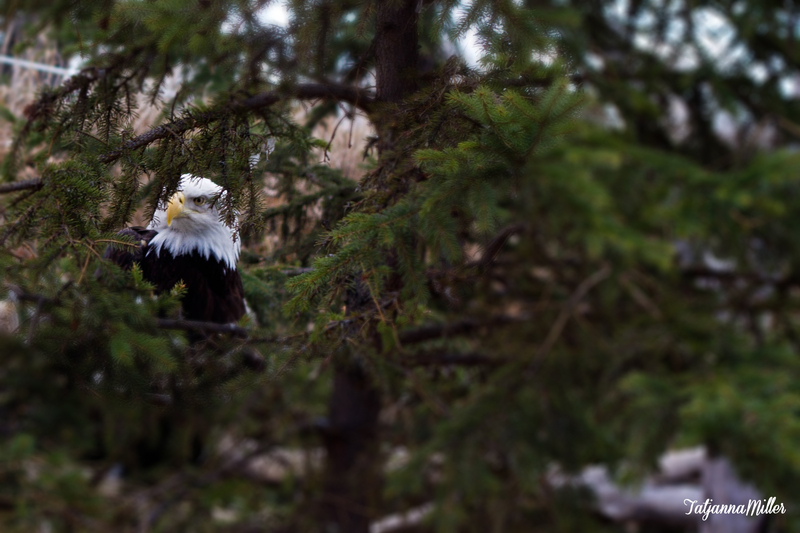 A Bald Eagle stares curiously through a pine tree. Koosaka, 1 of 300 Siberians left in captivity. 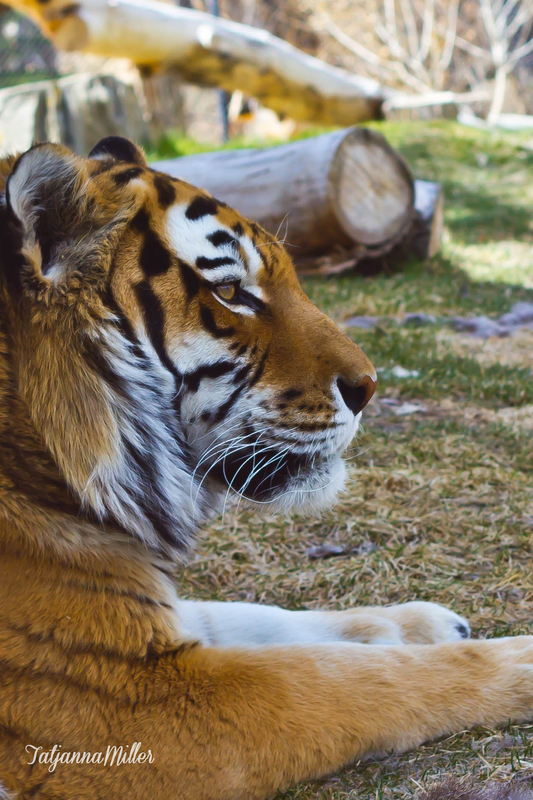 There are roughly 100 Amur (Siberian Tigers) left in the wild, with the densest population being in Eastern Russia and Asia. They are mercilessly hunted for their pelts and for traditional medicines. P.S. If you would like to help me save up for my own trail hikes and photographic adventures and volunteer trips, just click the link at the top!